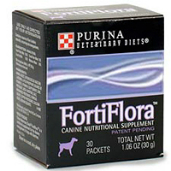 Shop for probiotic supplements for dogs & cats at VetDepot.com. 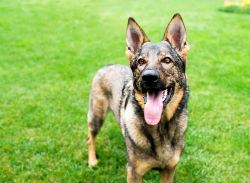 The health of an animal's gastrointestinal tract is crucial to his or her overall wellbeing. The GI tract is the largest immune organ in the body and home to an almost unthinkable number of microorganisms (trillions in the case of human beings). The presence, absence, and ratios between all the various species that are found in the gut have a major effect on health of dogs and cats. Supplementing a pet's diet with beneficial microorganisms called probiotics is an effective way to treat or prevent diseases of the GI tract and possibly, throughout the body. Probiotics are defined as living microorganisms that when ingested in adequate amounts confer a health benefit for the individual taking them. To be considered a probiotic, microorganisms must be resistant to the acidic environment of the stomach, be able to proliferate within and adhere to the lining of the intestinal tract, counteract pathogenic (disease-causing) microorganisms, and have a beneficial effect on the host's the immune system. They must also not cause disease themselves. Microorganisms that are commonly considered to be probiotics include Bifidobacterium or Lactobacillus bacteria and Saccharomyces spp., a type of yeast. Probiotics directly affect the gastrointestinal tract in several ways. By increasing the numbers of beneficial microorganism that are present in the gut, disease-causing species have to compete harder for food, attachment sites on the intestinal wall, and other resources. Increased competition lowers the numbers of "bad" bacteria in the GI tract and the deleterious substances they secrete. Also, the "good" probiotic bacteria directly benefit GI function. They produce digestive enzymes that help dogs and cats break down food, manufacture B vitamins, and may positively affect the cells and mucus that provide a barrier between the potentially toxic gut environment and the rest of the pet's body. "Probiotics are defined as living microorganisms that when ingested in adequate amounts confer a health benefit for the individual taking them." It also appears that probiotics can modify their host's immune function with benefits that are not limited to the gastrointestinal tract. Studies have demonstrated their potential use in the treatment of pancreatitis, atopic dermatitis, immune disorders, and chronic kidney disease in cats. Supplementing a pet's diet with probiotics is very safe. The biggest downside surrounding their use is that their benefits typically wane quickly once supplementation is stopped, perhaps because the microorganisms are unable to survive and reproduce within the gastrointestinal tract for long periods of time. This isn't a big concern when probiotics are used to treat an acute illness (e.g., diarrhea that developed secondary to antibiotic use), but when dealing with chronic conditions they should be considered a disease management tool rather than a cure. One way to improve the long-term effectiveness of probiotics is to include a prebiotic in the supplement. Prebiotics are non-digestible ingredients that support the growth of probiotic microorganisms that are either residing in the gut naturally or are added via supplementation. Prebiotics are a way to preferentially feed the "good" microorganisms in the gut giving them a potential advantage in their competition with the "bad" microorganisms. Fructooligosaccharides (FOS), chicory, arabinogalactan, and inulin are all prebiotics that are commonly used in dietary supplements for dogs and cats. 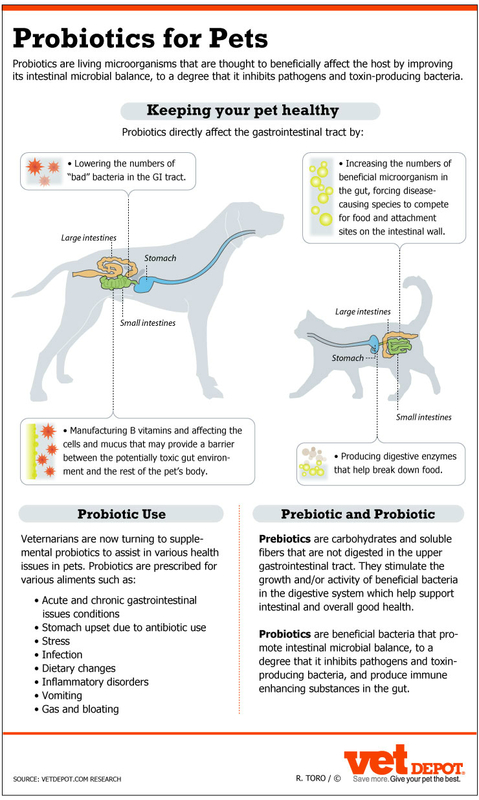 Many different probiotic dietary supplements for dogs and cats are now on the market. Ideally, a probiotic should contain a large number of live microorganisms coming from several different species. The addition of a prebiotic may also enhance the product's effectiveness. However, different individuals seem respond better to different products, so no one brand is best in every instance. A probiotic's ingredient list provides important information, but unfortunately there is no good way for consumers to determine whether what is printed on the label is actually what is found inside. At this time, the best way to ensure product quality is to purchase probiotics made by reputable, established companies and to monitor a pet's response to treatment. Effect of the probiotic Enterococcus faecium SF68 on presence of diarrhea in cats and dogs housed in an animal shelter. Bybee SN, Scorza AV, Lappin, MR. J Vet Intern Med. 2011 Jul-Aug;25(4):856-60. Effects of a probiotic intervention in acute canine gastroenteritis--a controlled clinical trial. Herstad HK, Nesheim BB, L'Abée-Lund T, Larsen S, Skancke E.J Small Anim Pract. January 2010;51(1):34-8.